Welcome to the first NFL Week in October, the spooky month. In this action-packed week of football, the two NFL teams that remain undefeated might end their tremendous winning streak. The Los Angeles Rams and the Kansas City Chiefs face extremely difficult road tests in Denver and New England, respectively, but from what we've seen in the 2018 regular season so far, both teams are capable of producing a win, regardless of what is thrown at them. The week starts with a clash between two NFC East rivals that are both in desperate need of a win and ends in Green Bay where the Packers are likely to walk away with a victory over the San Francisco 49ers. The second week of October will also feature the first matchup in London, as the Oakland Raiders and the Seattle Seahawks venture across the pond to clash at Wembley Stadium. We at Grizzly Gambling are back to provide you with more expert predictions and picks on the best upcoming NFL games for Week 6, helping you to make a more educated betting decision on the football sports betting action for the week ahead. The fifth week of the NFL is going to haunt a handful of teams as well as most of the kickers in the National Football League, especially Mason Crosby. However, a couple of teams did manage to have a huge day and most of them really needed a win, like the Vikings and Steelers. The Panthers managed to win against the Giants with a 63-yard field goal and the Cleveland Browns finally got a win on Sunday in overtime. Both the Rams and Chiefs remained undefeated, while the Cardinals, the last winless team in the NFL, finally claimed their first win for the season. The Jaguars and Chiefs staged a battle of defence vs. offence, and as the NFL goes, the offence won. Chief's Patrick Mahomes threw two picks with no touchdowns, making it his worst game yet, but he was still miles better than Blake Bortles, and, finally, the Cowboys and Texans finished things up on Sunday with an overtime matchup where the Texans celebrated a 19-16 win over the Cowboys. 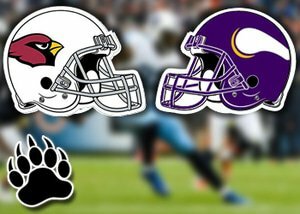 The Minnesota Vikings will look for their second consecutive victory when they play host to the Arizona Cardinals at the U.S Bank Stadium on Sunday afternoon. The Cardinals are returning from a 28-18 win on the road against the 49ers, while the Vikings enjoyed a 23-21 win over the Eagles in Week 5. Minnesota managed to claim a 30-24 victory over the Cardinals when they last met in 2016. The Cardinals will have loads of confidence in this game after claiming their first victory for the season when they defeated the 49ers in a spectacular 28-18 road win. Josh Rosen had some trouble when he made his second start for the NFL season, completing a mere 40% of his passes for a total of 170 yards. He currently has 386 passing yards along with 2 touchdowns and 1 interception for the season. David Johnson added 55 rushing yards in Week 5 and only has a total of 242 rushing yards for the season. Christian Kirk made 3 grabs for 85 yards in Week 5 and currently leads the Cardinals with 234 receiving yards for the year. Arizona's offence has been terrible where they are ranked at the bottom of the NFL in multiple offensive categories. Arizona's defence has been superb in three consecutive matches. The limited Seattle to only 20 points in Week 4 and the 49ers to a mere 18 points in Week 5. The Cardinals are struggling against the run but its thankfully countered by a remarkable pass defence. The Cardinals are currently tied for the last place when it comes to the NFC West division, and they are likely to experience a difficult season ahead. They are currently ranked 31st within the NFL with an average of 13 points and 11th overall as they are allowing 22.4 points on average. The Vikings bounced back after a two-game losing streak with their much-needed 23-21 win on the road against the Eagles in Week 5. Kirk Cousins was phenomenal, accumulating 301 passing yards with 1 touchdown. He currently boasts with 1,688 passing yards along with 11 touchdowns and 2 interceptions for the year. Dalvin Cook will not be available in Week 5 due to a hamstring injury and will be replaced by Latavius Murray. The dangerous duo of Stefon Diggs and Adam Thielen continues to shine as they accumulated 207 receiving yards in Week 5. Minnesota's offence has finally found a rhythm, amassing 54 points in the previous two matches after a difficult 27-6 loss at home against the Bills in Week 3. Minnesota's defence is back on track thanks to a remarkable performance against the Eagles in Week 5, only allowing 2 touchdowns. Their overall defence is nowhere near their performance from last season as they are missing Everson Griffen who is unavailable for the entire season due to a hand injury. The Vikings are tied for second place in the NFC North division and are averaging 22.6 points which rank them 22st overall. Minnesota is conceding 26.5 points on average, placing them 24th with the NFL. The Vikings are 17-6 ATS in the last 23 matches at home against a team with a losing record on the road, 8-2 ATS in the last 10 matches after amassing over 250 passing yards in the last match, and 4-0 ATS in the last 4 games in October. The Cardinals are 0-3-1 ATS in the last 4 matches against Minnesota, 3-12-1 ATS in the last 16 matches after a straight-up victory, and 3-7 ATS in the last 10 matches on the road overall. We are going with the Vikings in this game. Arizona has the worst offence within the NFL. They also rank dead last in the NFL due to a 65 rushing yards average per contest and Minnesota's rush defence is able to limit opponents to a mere 99 rushing yards per contest. Josh Rosen has only managed to complete 49% of his passes for the year and the Vikings shouldn't have any problem stopping him in this game. We expect the Vikings to lead by a huge margin in this matchup. The Cleveland Browns will look for their second consecutive win when they play host to the Los Angeles Chargers at FirstEnergy Stadium on Sunday afternoon. The Chargers enjoyed a 26-10 win at home against the Raiders in Week 5, while the Browns claimed a 12-9 overtime victory against the Ravens in their last match. The Chargers recorded a 19-10 win at home against the Browns in the previous season. The Chargers will look for their third consecutive win this week after recording a 24-10 win at home against the Raiders in Week 5. Philip Rivers was outstanding, collecting 339 passing yards with 2 touchdowns. He currently has 1,498 passing yards along with 13 touchdowns and 2 interceptions for the season. Melvin Gordon is the leading rusher for the Chargers where he accumulated 58 rushing yards in Week 5. He currently has 334 rushing yards for the season. Keenan Allen recorded 6 catches in 4 of the last 5 games and has 372 receiving yards for the year. The Chargers are consistently moving the ball offensively in every match, and their lowest output offensively this season occurred in a 38-23 loss on the road against the Rams. Los Angeles' defence provided their best performance against the Raiders where they only allowed 289 in total yards. The Chargers rush defence is ranked at 10th within the NFL, limiting the Raiders to a mere 41 rushing yards in Week 5. With an average of 27.4 points, the Chargers are ranked at 8th in the NFL. Los Angeles is allowing 26 points on average which is good for 22nd overall. The Browns played remarkably well against the Ravens in their 12-9 overtime victory at home in Week 5. Baker Mayfield was tremendous, amassing 342 passing yards with 1 touchdown and 1 interception. He has a total of 838 passing yards along with 3 touchdowns and 3 interceptions for the season. Carlos Hyde is the leading rusher for the Browns, adding 63 rushing yards in Week 5. He currently has 348 rushing yards with 5 touchdowns for the year. Jarvis Landry made 5 catches in 4 of 5 games this season and recorded 381 receiving yards for the year. Cleveland's offence is solid this season with Baker Mayfield looking very promising. They are currently ranked 17th within the NFL, averaging 376 in total yards per contest. Cleveland's defence was incredible against the Ravens in Week 5 where they allowed 0 touchdowns. There're several playmakers that are extremely talented in the team, including Denzel Ward and Myles Garrett, who managed to deflect 3 passes in Week 5. The Browns are scoring 22.8 points on average which ranks them 20th in the NFL. Cleveland is allowing 22.6 points on average which is good for 12th place overall. The Browns are 3-14-1 ATS in the last 18 matches against a winning record team, 2-10 ATS in the last 12 matches after amassing over 250 passing yards in the last game, and 0-6 ATS in the last 6 matches after they allowed less than 15 points in the last game. The Chargers are 4-1 ATS in the last 5 matches in Week 6, 4-1 ATS in the last 5 matches in October, and 7-3 ATS in the last 10 matches after accumulating over 250 passing yards in the last match. We are taking the Chargers in this matchup. The offence of the Chargers is playing extremely well with Philip Rivers leading the way. Rivers threw at least 2 touchdown passes in every game this year and completed 70% of his pass attempts for the season. Although Cleveland's defence is talented, there is still loads of work to be done. The Browns pass defence is struggling as well, surrendering 281 on average per contest which ranks them 27th in the NFL. The Chicago Bears will take to the road as they face the Miami Dolphins on Sunday afternoon at the Gard Rock Stadium in an inter-conference battle. The Bears are returning from a 48-10 win at home against the Buccaneers in Week 4, while the Miami Dolphins suffered a 27-17 loss on the road against the Bengals in Week 5. The last time the Dolphins and the Bears met was in 2014 where Miami claimed a 27-14 victory. The Chicago Bears will ride on a wave of confidence after defeating the Buccaneers in a mind-blowing 48-10 victory in Week 4 before they enjoyed a bye week in Week 5. Mitch Trubisky was incredible in Week 4, accumulating 354 passing yards with 6 touchdowns and 0 interceptions. He currently has 945 passing yards along with 8 touchdowns and 3 interceptions for the season. Chicago has a terrifying duo on the ground, featuring Tarik Cohen with 139 rushing yards and Jordan Howard with 203 yards. Taylor Gabriel accumulated 104 receiving yards while playing against the Buccaneers and is currently ranked second in the team behind Allen Robinson who has 193 yards when it comes to receiving. Chicago's offence has managed to accumulate loads of points this season with the exception of the Cardinals road win. Chicago's defence is living up to their expectations this year, roasting their opponents in 3 successive matches and limiting them to a mere 294 yards per contest which is good for 3rd in the NFL. The Bears are boasting with 3 consecutive matches and are currently in 1st place when it comes to the NFC North division. The Bears are averaging 27.8 points which ranks them in 7th place in the NFL. Chicago's defence holds opponents to only 16.2 points which places them 3rd in the NFL. The Miami Dolphins will make their way into this match on a sour note after their 27-17 loss on the road against the Bengals in Week 5. Ryan Tannehill was struggling during the loss, collecting 185 passing yards with 1 touchdown and 2 interceptions. Tannehill currently has 972 passing yards along with 8 touchdowns and 5 interceptions for the year. Frank Gore is the leading rusher for the Dolphins where he averaged 5.3 yards per carry for a total of 63 yards in Week 5. Gore currently boasts with 202 rushing yards for the year. Kenny Stills is the top receiver for the Dolphins with a total of 241 receiving yards for the season. Miami's offence has been struggling in the last two matches after a brilliant start this year. They are currently ranked 30th within the NFL with an average of 288 total yards per contest. Miami's defence is in serious trouble of late, conceding 24 points during the 4th quarter while playing against the Bengals, but offensive turnovers played a huge role in the meltdown last week. Both the pass and rush defence of Miami ranks in 20th place in the NFL. Miami has now lost 2 consecutive games after enjoying 3 consecutive victories at the start of the season. With an average of 19.8 points, the Dolphins are ranked at 28th in the NFL. Miami is also allowing 23.4 points on average, ranking them 16th overall. The Dolphins are 1-4 ATS in the last 5 matches against a winning record team, 9-23-1 ATS in the last 33 matches after an ATS loss, and 1-6-1 ATS in the last 8 matches after a straight up loss. The Bears are 5-1 ATS in the last 6 matches overall, 4-1 ATS in the last 5 matches in October, and 6-1 ATS in the last 7 matches after accumulating over 350 total yards in the last match. We are taking the Bears in this matchup. Miami has seriously struggled in their last two matches against the Bengals and Patriots where they were outscored by a 24-65 margin in the last two matches. Ryan Tannehill only managed to collect 285 passing yards along with 1 touchdown and 3 interceptions in the previous two matches and he will be up against a solid Bears defence that limits opponents to 230 passing yards on average per contest. In addition, Miami's running game is going to have some serious trouble against the rush defence of the Bears that is currently ranked 1st in the NFL. Week 6 of the NFL is going to be another explosive weekend where bettors can expect stunning victories as well as plenty of unpredictable upsets. The biggest challenge will be to find a reputable online sportsbook that offers the best odds on each game. Thankfully, we at Grizzly Gambling already did the necessary research for you and highly recommend that you place your NFL bets at Spin Palace where you'll be greeted with a fantastic welcome offer if you don't have an account already. For those of you that are new to the world of NFL betting, or just sports betting in general, we got you covered. Before you decide to place any bets on the NFL games for week 6, we urge you to read our complete guide to sports betting in Canada where you'll be able to educate yourself on the different betting markets, betting types, and more. We sincerely hope you make a profit with our predictions and picks for Week 6 and look forward to seeing you again next week.